For a limited time only, SoCalGas is offering a bonus of up to 50% more of your total incentive amount! If you are completing a Home Upgrade project in any SoCalGas territory excluding LADWP this can encourage your customers to go for deeper retrofits and maximum energy efficiency. This will be a great way for you to increase sales before the summer rush. Be sure to enter the code “Spring19” in the Coupon Code field when entering your application in the WebApp. This will help the Program team track the number of projects that benefitted from the Spring Special. Contact your Account Manager with any questions. The SoCalGas Home Upgrade program no longer falls under the umbrella of Energy Upgrade California®. Most program documents have been updated to reflect the look that aligns with the SoCalGas brand. You can find these updated materials on the contractor website. 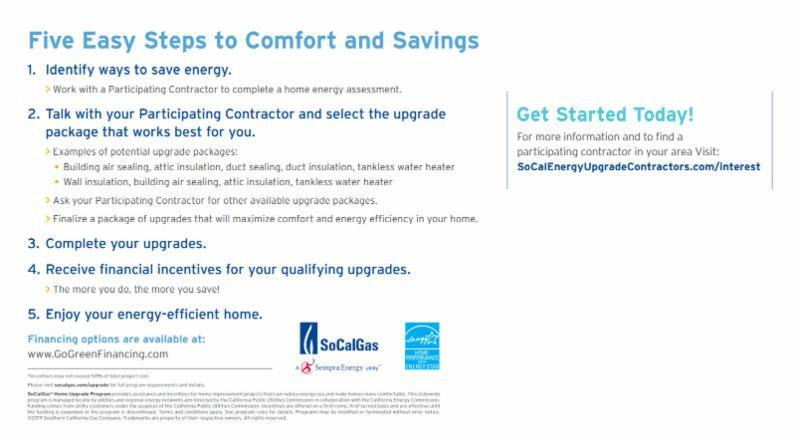 SoCalGas is actively promoting the Home Upgrade program to customers. During March, SoCalGas distributed a marketing email promoting the Spring Special to 400,000 customers throughout the service territory. This led to nearly 1,500 customers visiting the Find a Contractor page in a single day! The email will be distributed multiple times and to a broader group of SoCalGas customers in the coming weeks. In addition, the program team worked in conjunction with SoCalGas to develop a promotional postcard targeting the Riverside area. The postcard, pictured below, promotes the incentives and encourages customers to visit the website and find a contractor. These postcards will be distributed up to 14,000 customers in May. Great News! iPermit E Raters is now available to provide post-retrofit diagnostic testing and project processing services. We encourage you to make the most of our limited time free third-party testing and project processing in conjunction with program-approved Raters. ERE Inspections is already providing post-retrofit diagnostic testing and project processing services to contractors. Take advantage of this opportunity to have these services covered by the program at no cost to you; these savings can help you increase sales by passing discounted pricing on to your customers. Please note: Raters may also offer special pricing on Advanced Home Upgrade testing and processing – check with your Rater for details. Lennox Smart Thermostats (iComfort s30, e30, and m30) join the list of smart thermostats eligible for an incentive in this program. Other models eligible for incentives include qualifying Nest, Ecobee and Honeywell Lyric™ Wi-Fi smart thermostats. Please refer to the Info Sheets and Incentive Application Forms to view the full list of eligible smart thermostat models. RHA and ICF constantly review data to see where there are areas we can help contractors navigate the program more effectively. A recent review of program data has indicated that gas leaks are a top issue identified during the on-site QC inspection. Gas leaks will be detected and tested using an electronic leak detector at 1" per one second. If a potential leak is identified, it will be confirmed with micro leak detection solution. Closely examine the following: gas meter sets, line valves, gas control valves, pilot lines, joints, fittings and any accessible gas lines. For unconfined gas meter sets, outdoor appliances and associated piping that are not part of the SOW, and appliances having no direct effect on the living space, olfactory testing (smell test) will be used. Persons not sensitive to the odorant in natural gas must use an electronic detector. If gas odor is present or homeowner/designated representative has reported a gas odor, use an electronic leak detector. If electronic leak detector identifies a potential leak, use a leak detection solution to confirm the leak. 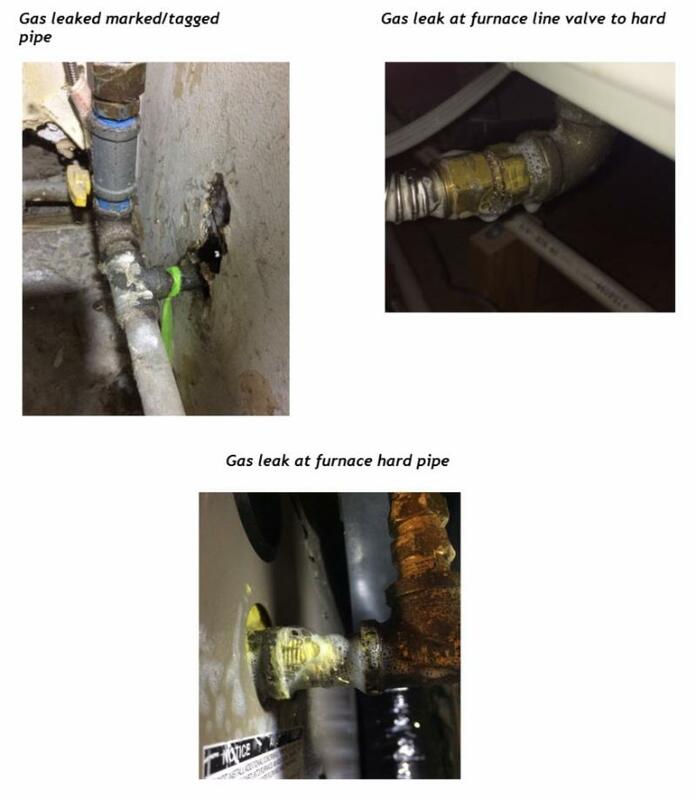 Gas lines and connections that are part of the SOW and are within an area that may have a direct affect to the living space but are inaccessible to electronic leak detectors and micro leak detector solution will be subjected to olfactory testing. If odors consistent with gas leaks are detected by the inspector, a gas leak will be deemed to be present. If a gas leak is found, advise the customer to notify their contractor or SoCalGas immediately. Do not perform any combustion appliance safety tests or diagnostic testing until the leak is repaired or isolated. Close the line valve, and retest in same place where the gas leak was found with micro leak detector solution. If leak is no longer present, proceed with combustion safety and diagnostic testing. If a gas leak cannot be isolated, mark the location of the gas leak by tying a brightly colored string around the pipe at the leak site until SoCalGas Gas Service Technician or licensed personnel repair the gas leak. Conduct an additional gas leak test to verify that the leak has been repaired and that no other leaks are present. If gas leaks are no longer present, proceed with combustion safety and diagnostic testing. All identified gas leaks need to be repaired as they present a health and safety issue and should always be taken seriously. Home Upgrade projects must be following the program health and safety requirements prior to project processing. Refrain from using soap and water instead of micro leak detection fluid. Soap and water may lack the proper viscosity required for definite bubbles to form on metallic surfaces and it has corrosive properties that may promote damage to the fittings being tested. Do not add water to the micro leak detection fluid. Be patient! Often times even severe gas leaks form bubbles slowly depending on the position and application of the fluid. It’s good to give it a few minutes before you make a determination that there is no leak. It could save you and the customer the additional frustration. 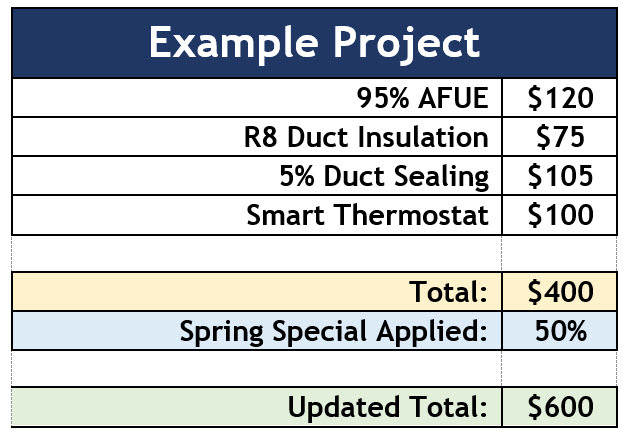 Do you or your team members start by offering baseline equipment, then “upsell” with a pitch for more energy efficient models that qualify for Home Upgrade? There may be a better way: lead with the value of energy efficient models. By starting with equipment that qualifies for energy-saving programs from trusted sources, you can build trust in efficient models. In addition to Home Upgrade, consider the state-sponsored Residential Energy Efficiency Loan (REEL) program to build credibility. With REEL, customers can finance single-measures, whole house upgrades, and even use up to 30% of the loan to finance other related home improvements. Plus, the REEL program offers a homeowner-facing website and contractor marketing resources to help you get more customers. Want to offer REEL to your customers? Sign up today. Become a REEL Participating Contractor by visiting GoGreenFinancing.com/residentialcontractors or learn more by contacting the REEL Contractor Support team at 1-800-484-0109 or REEL@frontierenergy.com. 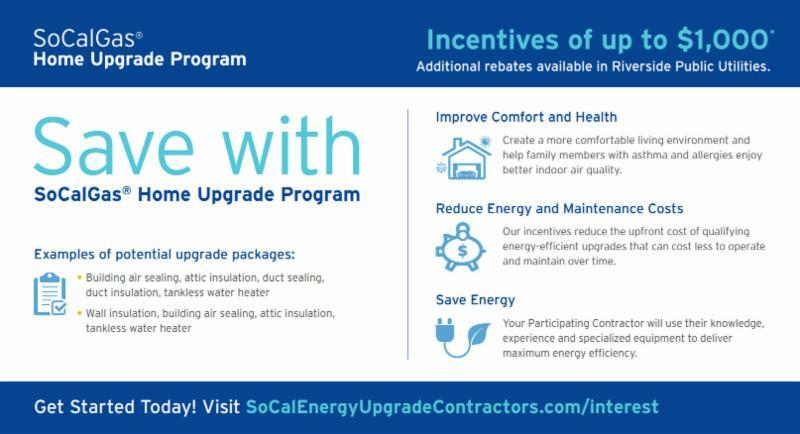 The SoCalGas® Home Upgrade Program is implemented by ICF under a contract awarded by the administrator, SoCalGas, through December 31, 2019. Please visit socalgas.com/upgrade to view the full program disclaimer and additional program details. View the full program disclaimer and additional program details here. For a limited time only, SoCalGas is offering higher incentives of up to 50%! 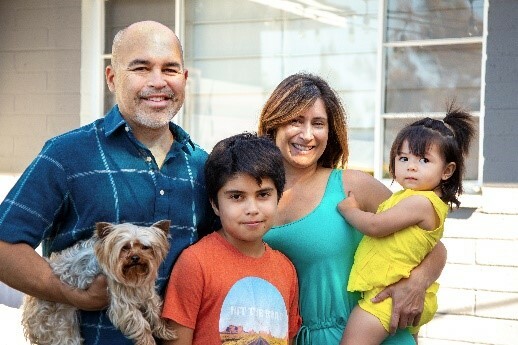 If you are completing a Home Upgrade in the non-LADWP SoCalGas territories this can encourage your customers to go for deeper retrofits and maximum energy efficiency. This will be a great way for you to increase sales before the summer rush. Be sure to enter the code Spring19 in the Coupon Code field when entering your application in the WebApp. This will help the Program team track the number of projects that benefitted from the Spring Special. Contact your Account Manager with any questions. All Program documents will continue to be updated to reflect new branding throughout the next few months. For updated program documents please visit the Contractors website here. With rebate availability changing, contractors are looking for financing tools to help sell energy efficient upgrades. The state-administered Residential Energy Efficiency Loan (REEL) program is a non-PACE financing option for Home Upgrade projects and beyond. Start offering customers monthly payment options with no pre-payment penalties today! Participating comes at no cost to contractors. This Case Study shows how a Participating Contractor used REEL to achieve the homeowner’s dream energy efficiency project. Contact the REEL Contractor Support team directly at 1-800-484-0109 or email to get one-on-one coaching. It’s easy to get started! The program training takes about 1 hour to complete and is available online, anytime at GoGreenFinancing.com. Not sure if REEL is for you? Contact the REEL Contractor Support team directly at 1-800-484-0109 or email and we can help. Deadline Approaching to Post Submit Projects Reserved in 2018! 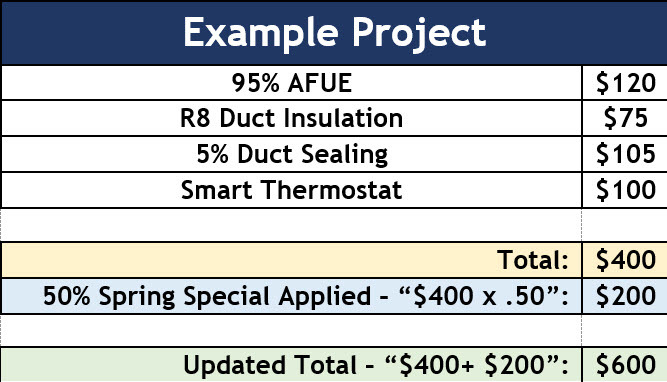 Make sure your customers receive their incentive: All projects reserved in 2018 must be post-retrofit submitted by Friday, February 8, 2019. Ensure completion of post inspections and allow yourself time to resolve any issues identified during the third-party review. Contact your account manager if you have questions or need assistance. The state-backed REEL program makes it easy to get started in energy efficiency financing. 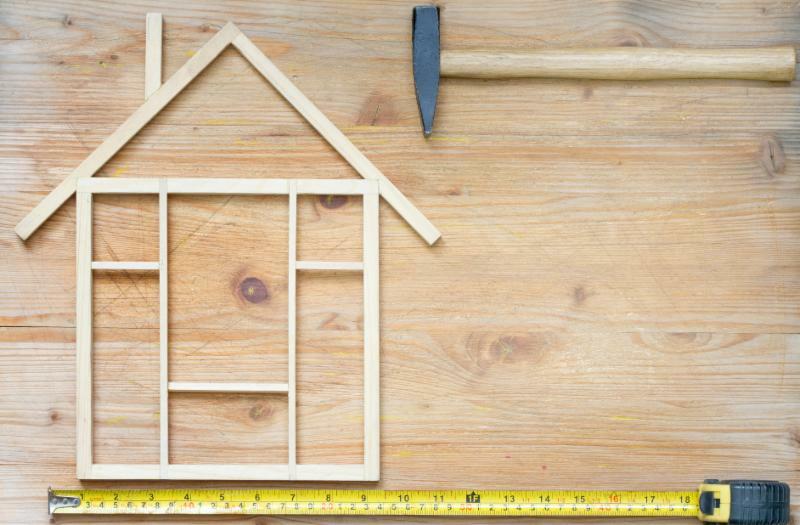 Home Upgrade rebate availability is changing, and customers will be looking for new ways to make projects more affordable. Financing enables low monthly payments so that your customers can make the upgrades they want―from single measure projects through larger Advanced Home Upgrade projects. The Residential Energy Efficiency Loan (REEL) program offers trusted, state-administered financing, and unparalleled contractor support. No Up-Front Costs: These costs include origination and closing fees charged by a lender for processing the loan application. REEL has no up-front costs. No Prepayment Penalties: With many loans, prepayment penalties are charged if a borrower pays off the loan before the loan’s term. REEL has no prepayment penalties, so customers can pay off their loan early worry-free. Low Annual percentage rate (APR): APR is the yearly interest rate on the loan, plus the cost of any other charges (for example, annual fees). Using APR to compare different loan packages will help your customer make the right choice for their project. REEL lenders offer competitive rates! No Collateral required: Some loans require a borrower to pledge assets to the lender in case of loan default. This is often the property itself or the equipment. With REEL, no collateral is required! Quick Pre-Approval: Sometimes working with a lender and confirming how much can be borrowed is a lengthy process. All REEL lenders provide pre-approval within 24 hours of inquiry. Start talking to your customers about REEL today! Already a REEL Participating Contractor? Inquire about cobranded REEL flyers by emailing your company information and logo to reel@frontierenergy.com! Become a REEL Participating Contractor. It’s fast & free to enroll! Start the online training and application at GoGreenFinancing.com. How are our complimentary Diagnostic Testing and Project Processing working out for you? As of now, 57% of the SoCalGas Only program incentive budget is remaining. Budget updates are scheduled to go out twice a month unless stated otherwise. Please contact your account manager to see how you can take advantage of the remaining incentive budget. 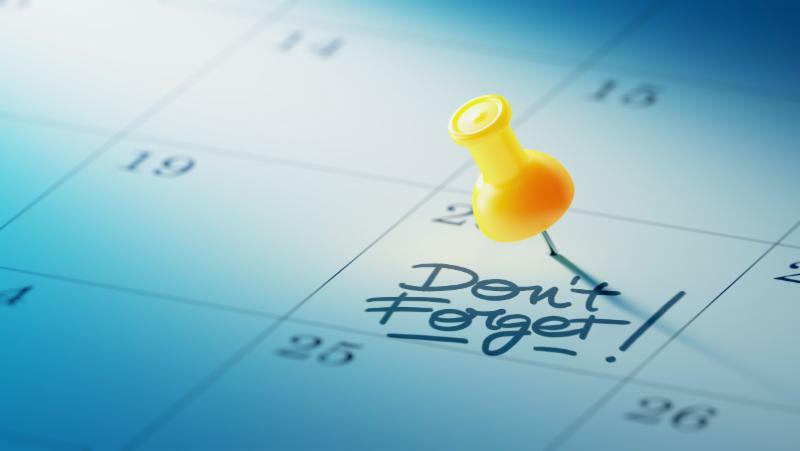 As the end of 2018 fast approaches, please remember to reserve your projects and submit post retrofit information as quickly as possible. Also, please respond promptly to requests for information and review projects currently in Pending Action statuses to see if they are able to proceed and move forward. The program is working hard to close out as many projects as possible in 2018. We appreciate your cooperation to end the year on a high note for both you and your customers. SoCalGas would like to confirm that the Home Upgrade Program will return in 2019. The Program will begin accepting reservations again on January 1, 2019. The program will offer incentives on approved projects where measures are purchased and completely installed between January 1 and December 31, 2019. Please note that projects in the Los Angeles Department of Water and Power (LADWP) service territory will continue to receive 100% of the calculated incentive if there are both gas and electric savings associated with the project. Projects served by a municipal utility other than LADWP will receive 30% of the calculated incentive for gas savings. Effective January 1, 2019, the Home Upgrade program will no longer fall under the umbrella of Energy Upgrade CA. The program will be administered by SoCalGas and will have new branding. All program materials and documents will be updated to reflect this new look. Contractors will be given a grace period within which to download and begin using documents with the new branding. Stay tuned for more updates. The state-backed REEL program, with $5M in energy efficiency loans and growing, makes it easy to get started in financing. Home Upgrade rebate availability is changing, and customers will be looking for new ways to make projects more affordable. Financing enables low monthly payments so that your customers can make the upgrades they want – including comprehensive Advanced Home Upgrade projects. The Residential Energy Efficiency Loan (REEL) program offers trusted, state-administered financing, and unparalleled contractor support. Up-Front Costs: Some loans have an origination fee charged by the lender for processing the loan application. REEL has no up-front costs. Prepayment Penalties: With many loans, prepayment penalties are charged if a borrower pays off the loan before the loan’s term. REEL has no prepayment penalties, so customers can pay off their loan early worry-free. Annual percentage rate (APR): The yearly interest rate on the loan, plus the cost of any other charges (for example, annual fees). Using APR to compare different loan packages will help your customer make the right choice for their project. REEL has multiple participating lenders to compare, offering competitive rates! Collateral: Something of value (such as the borrower’s home) that can be used as security if payments are not made and the loan defaults. With REEL, lenders do not require collateral! Pre-Approval: The process in which a borrower works with the lender to confirm how much they qualify to borrow, before they officially apply. All REEL lenders provide pre-approval within 24 hours of inquiry. that can reduce energy use and make homes more comfortable. This statewide program is managed locally by utilities and regional energy networks and directed by the California Public Utilities Commission in collaboration with the California Energy Commission. Funding comes from utility customers under the auspices of the California Public Utilities Commission. Incentives are offered on a first-come, first-served basis and are effective until the funding is expended or the program is discontinued. Terms and conditions apply. See program rules for details. Programs may be modified or terminated without prior notice. ©2018 Trademarks used with permission and are property of their respective owners. All rights reserved. Attention All: Joint Program Post-Retrofit Submissions are Closed! No Projects will be paid out in 2019. Post-retrofit project information submissions are closed in the Joint Program. Building Performance Institute (BPI) Certification Training has been moved to 11/12/2018 through 11/16/2018. Contact Lorelei Penera at (858) 444-3915 for more details. Tickets to IHACI are free, and we’d be happy to send you paper tickets for your team! Simply contact your account manager, or request tickets from the REEL Contractor Support team directly at 1-800-484-0109 or REEL@frontierenergy.com. You can also avoid registration lines by pre-registering online for a speed badge at www.ihaci.org. Attention All: Joint Program is closed for reservations! Complete Construction as soon as possible. Thank you to all Contractors! Thank You, Contractors, for Contributing to our Success! The energy you helped save is equivalent to removing more than 13,500 metric tons of CO2 – making a real impact and helping improve quality of life for your customers and all Californians. We are proud of what we have achieved together and look forward to working with you again on future program endeavors. Beginning September 1, 2018 both the Southern California Regional Energy Network (SoCalREN) and joint SCE/SoCalGas territories will become part of the SoCalGas Only Program. This will cover all territories where SoCalGas provides gas service. Projects will be incentivized at the rate of 30% of the total incentive amount (for Home Upgrade) or total energy savings amount (for Advanced Home Upgrade) for projects in the SoCalGas Municipalities excluding the Los Angeles Department of Water and Power (LADWP). LADWP customers will continue to receive 100% of the incentive when additional conditions are met. The program will be working in partnership with Raters to offer free third-party diagnostic testing and project processing, too! You could save up to $1,000 per project and pass these savings on to your customers. Please contact your account manager for more details. Even though the SCE/SoCalGas program is no longer accepting new reservations, contractors who currently have projects in the pipeline for post-retrofit processing must ensure that SCE is listed as an additional insured/certificate holder on their insurance documents until December 31, 2018. This requirement applies to both general liability and workers’ compensation insurance. 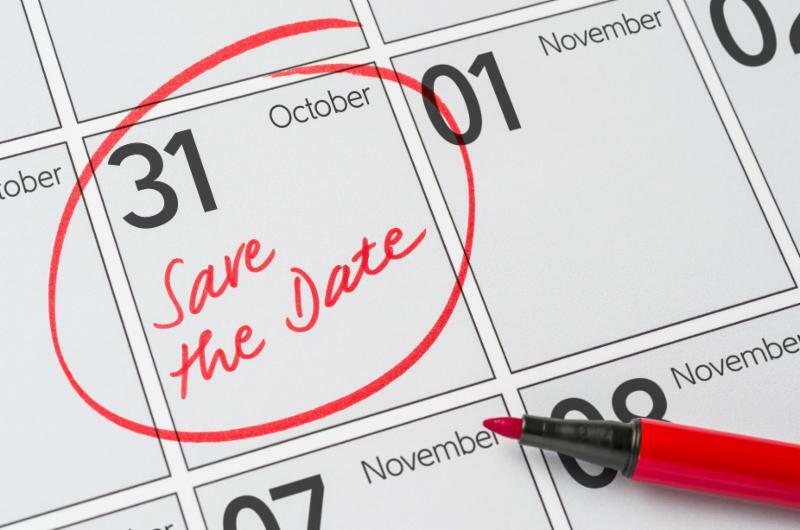 To receive an incentive, all projects that were reserved by August 31, 2018 must be post-retrofit submitted with all required documentation by October 31, 2018. No exceptions. Please note: this deadline only apply to SCE/SoCalGas projects. No incentive checks will be issued in 2019. The Contractor Participation Agreement was updated earlier this year to be more contractor-friendly and is now available on the contractor website here. The account management team has been reaching out to contractors to ensure that they comply with this requirement. We are happy to report that most contractors have responded and are in compliance. If you have received an email with the documents for completion, please reply as soon possible. Failure to return the signed documents could result in your projects not being processed before the program closing date. BPI On-Staff for Advanced Home Upgrade is no longer a requirement for participation in the program. Mentoring is no longer required by the program. Review the August 2018 newsletter for more information on these topics. Based on whether you are submitting a default path project, a custom path project or a custom path project with utility bill calibration, there are different requirements for which default values to use. Consulting the Snugg Pro Energy Modeling Guide Version 2.0 and the OptiMiser® Energy Modeling Guide Version 1.0 will help you understand how default values are used in the various paths. If you have questions regarding any of these values please reach out to your ICF account manager, or RHA. Although customers appreciate the benefits of energy efficiency programs, the inspection process can sometimes be daunting. That’s why the Residential Energy Efficiency Loan (REEL) program and the Home Upgrade program work together to streamline inspections for projects that go through both programs. 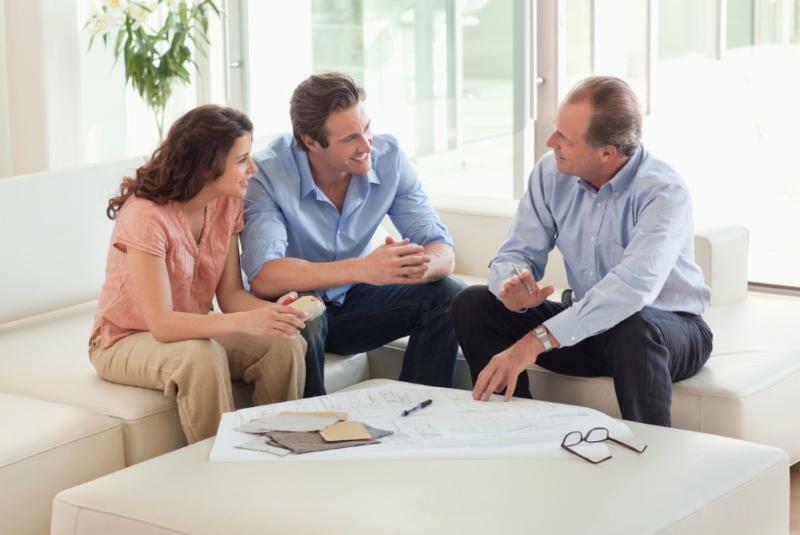 With financing, it’s even easier to sell larger projects, including Home Upgrade projects. If you finance a project using REEL that also goes through a utility rebate program like Home Upgrade, you’re in luck! Home Upgrade projects are already held to a high standard of quality. The REEL program accepts the Home Upgrade inspection rates, and there are no additional REEL inspections. If you finance a project using REEL that does not go through an IOU or REN rebate program, the REEL program may initiate random project inspections after the loan closes, to ensure all measures are installed. The REEL Contractor Support team is here to help. With one click or call, you can get up to speed on the program process and marketing resources, including co-branded collateral. Contact the REEL Contractor Support team at 1-800-484-0109 or REEL@frontierenergy.com to get one-on-one coaching. Visit GoGreenFinancing.com to fill out an application and complete the 1-hour program training course online, anytime. Explore our new program! Free testing and processing now available. As of now, 67% of the SoCalGas Only program incentive budget is remaining. Budget updates are scheduled to go out twice a month unless stated otherwise. Please contact your account manager to see how you can take advantage of the remaining incentive budget. Beginning September 1, 2018 both the Southern California Regional Energy Network (SoCalREN) and joint Southern California Edison (SCE)/SoCalGas territories will become part of the SoCalGas Only Program. This will cover all territories where SoCalGas provides gas service. Based on feedback from our contractors, the program has re-evaluated its insurance requirements and will no longer request proof of automobile insurance coverage for initial or continued participation, effective immediately. Contractors must be in compliance with state law on automobile insurance, but the program will not be requiring additional coverage. Going forward, the program will not request automobile insurance documents or place contractors in a probationary status due to lack of automobile insurance documents. The Contractor Participation Agreement was updated earlier this year to be more contractor-friendly and is now available on the contractor website here. The account management team has been reaching out to contractors to ensure that they comply with this requirement. We are happy to report that most contractors have responded and are in compliance. If you have received an email with the documents for completion, please reply as soon possible. Failure to return the signed documents could result in your inability to submit projects to the program. 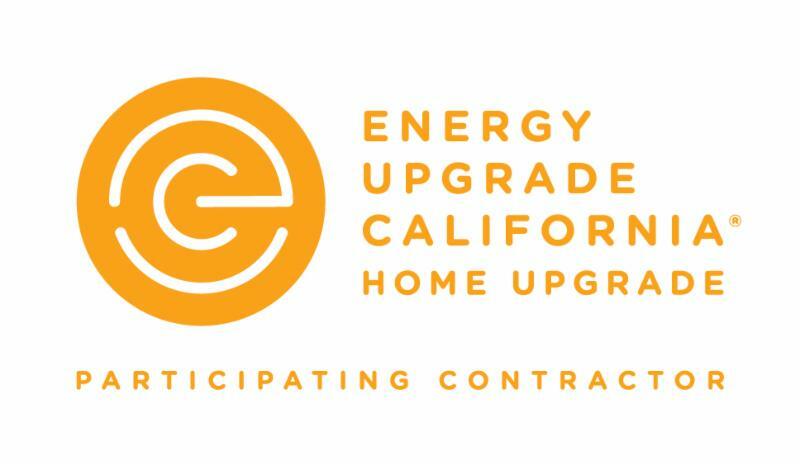 The Energy Upgrade California Home Upgrade program approved new branding for the statewide program during 2017, and SoCalGas approved and adopted the new branding effective September 1, 2018. Incentive Application forms, information sheets and all other program documents will be updated with the new logo and contractors will be notified via e-blast when they are available for download from the website. New logos for contractor use and the updated Energy Upgrade California Style Guide will be available here. Please contact Karen Sturgeon with SoCalGas for any questions related to branding updates.